Calculate Costs of Having a Baby - BabyCalc.com | Estimate prices for Baby Food, Diapers, Clothing, Furniture, etc cost. 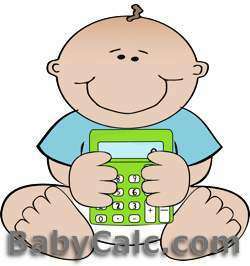 Baby Calculator will help new parents or those planning to have a baby calculate the cost of raising a child. The calculator includes such common expenses as: Baby Formula/Food, Clothing, Diapers, Baby Furniture, Toys, Car Seats and Accessories, Child Care (Nanny, Day Care), Enrichment Activities/Classes, etc. We are now on our 3rd child, and estimating these cost is still difficult, so we created this comprehensive tool, to help parents everywhere know how much it costs to raise a child, from 0 months to 5 years. We’ve broken this tool up into a “general” calculator which will give you approximate cost for the first years, and any consecutive years, based on your spending habits, quality of products, price level, and amount of stuff you are willing to buy. Because every parenting style is different, so will be you buying habits – some parents will want to buy everything there is, while some will want to buy as little stuff as possible. The truth is – when you are just planning your first baby, are are awaiting baby’s birth for the first time – you don’t yet know what and how much you will need, but you should already have preferences. For example, some parents will breastfeed, while others will opt for formula feeding. How do you know how much formula you will need, or can afford. You may also have a hard decision whether to use Organic or Conventional formula / baby food. Same goes for diapers, and clothing, and toys, and all the other good stuff that new parents thing is important, and will want to buy, but do not know how much it will cost over the first 3 months or a first year. We did the hard work for you, and after having three kids, and buying everything (necessary or not) we know how much this stuff will cost, and our tool will help you estimate these costs. We have also created Detailed calculators that will help you estimate the costs of one specific product type: Diapers, Baby Food, and Clothing. These will be the items hat you will always run out of, or your child will outgrow, so you will always need more.